Brazilians are among the world's biggest fans of Twitter. Now the microblogging site has become the setting for a battle of wits between police and residents of Rio de Janeiro over a drink-driving campaign known as Operation Lei Seca, or "dry law". Anyone who has had too many beers but wants to drive home can turn to a page on Twitter, where those who have seen the distinctive branded police vans warn others which routes to avoid. In turn, the traffic police are logging on to foil the efforts of the techno-literate, often setting up in unexpected locations elsewhere. Penalties include having your licence suspended, being fined and having your car towed away. There has also been an advertising campaign to raise awareness. The Rio state government says since the dry law began in March 2009, there have been more than 5,000 fewer cases of people being injured or killed on the roads. The campaign, which includes advertising to raise awareness, has been deemed such a success there are plans to extend it to other Brazilian states. Police stop and breathalyse drivers in the accident hotspots and enforce what is essentially a zero-tolerance policy. Success story on Rio's roads? And with Rio's Carnival getting into full swing this weekend, police checks are being stepped up. Co-ordinator Carlos Alberto Lopes, under-secretary in the Rio state government, is happy with what Operation Lei Seca has achieved so far. "I attribute these results to establishing constant and effective supervision and, especially, the awareness campaign, which has really changed driver behaviour," he said. 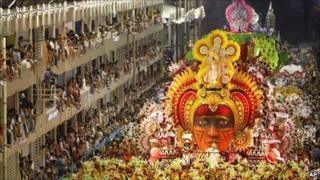 But for some Rio residents, the Lei Seca is just more unwanted interference from the authorities. Regular Twitter user Marcelo, who did not want to give his last name, said it was not just a way to drink and drive without fear of reprisal. "I think Lei Seca is a good thing, but sometimes I check the Twitter page on my Blackberry if I've forgotten my driving licence. It's just better to drive without being worried about anything," he said. "The police do sometimes check the Twitter page too and move their location, but not always and not for several hours." Another user, Rodrigo, says: "It isn't so much that people want to drink-drive. The public transport system is just so bad here. I live in Meier in the north of the city. If I drive to Gavea in the south zone, it will take me about half-an-hour, but if I took public transport it could be up to two hours. "There is no metro in most of the city and buses just take too long." The page, LeiSecaRJ, has been running since June 2009, three months after the dry law operation began and now has more than 150,000 followers. "When the operations started, people were warning each other on their individual Twitter accounts. We just put all these warnings in one place. It was already a spontaneous popular movement, we are just supervising it," said organiser Bruno Pontes. The intention, he said, was to help people get around the city. "As the number of followers increased, we extended it to cover floods, power cuts and traffic as well as Lei Seca operations," he said. "The problem with the Lei Seca operations is they aren't being used for the purpose for which they were intended. It's used to create revenue for the state. "The percentage of egregious drunk drivers is insignificant, less than 1%, while the seizure of vehicles and other irregularities is 15 to 16 times higher." But former health minister Jose Gomes has hit back at the Twitter page. "The Twitter page is undermining our strategy and good sense of the campaign. It's harmful," he said. Image caption Tweeting for the social good or to bend the rules? LeiSecaRJ has been nominated for Twitter's Shorty awards 2011, an annual event honouring the best producers of short, real-time content. Mr Pontes says a win "would be testament to the collaborative spirit of Brazilians" and shows how badly needed such information is. "We have all the problems of a city wedged between the mountains and the ocean," said Mr Pontes. He is calling for better security, 24-hour boat services and underground trains which would allow people to get home safely and quickly without driving after drinking. Building an efficient transport infrastructure in Rio is a key issue, with the city set to host the World Cup in 2014 and the Olympics two years later. A scheme to extend the metro to the east part of the city, costing $2.4bn (£1.5bn) was announced by Rio Governor Sergio Cabral on his re-election last October. A $1.5bn (£900m) programme of train improvements was unveiled at the same time. For some commentators, the use of Twitter to avoid Lei Seca operations is an example of the "jeitinho", the Brazilian way of getting round the rules and through layers of often exasperating bureaucracy. "The notion of justice is taken here in a very subjective way. Some rules are treated as important, while it doesn't seem to matter to transgress others," said psychologist and long-time Rio resident Lauriane Whittaker. "There is a paranoia about crime, and people spend their evenings watching guns and violent crime on TV. On the other hand, there is a mistrust of the police and people don't necessarily approve of police activities." Cheating the system is a way of registering disapproval and making a statement about perceived corruption, Ms Whittaker said. "At the same time, social media allows people to feel less involved because of the physical distance. If you post something on Twitter about Lei Seca, even if you know the guy who reads it might be drunk and crash his car, it somehow doesn't feel as real."